I recently presented at a Business Growth seminar with McInnes Wilson Lawyers, with a particular focus on growth via M&A (Mergers & Acquisitions), together with Allan Morris (experienced CEO & CFO) and Michael Hinchcliffe (Senior Associate, MCW). I’ve included most of my slides from that presentation below, along with my go-fast version of what I spoke about (hover over the slides for the comments). But access to capital is making it harder for people/businesses to buy those businesses… Which puts you in a great position to negotiate, if you are ready and able to transact. A lot of negativity out there at the moment, which is all impacting the willingness of banks to lend. BUT there is a huge wall of investable capital out there, resulting in a [slowly] increasing availability of non-bank debt & equity capital. On the left side is “Business As Usual” and Organic Growth… When it all boils down, there’s really only 3 key underlying uses of capital, (1) Working Capital, (2) Fixed Assets and, (3) ripping equity out of the business. On the right side, M&A is not much different - just that money goes to Working Capital, Fixed Assets and the acquisition of Goodwill. Are the Banks willing to lend? The goal posts have been moving on a regular basis, particularly post-Royal Commission. Banks now really just want plain vanilla deals - anything with complexity and you had better be prepared to fight hard to get them interested. And do that with the RIGHT bank AND banker, because we often say that you can take the same deal to two different bankers within the same bank and get two completely different outcomes. Ultimately, these days, confidence in the ability to get finance comes down to doing a professional pitch to the banks (that’s the plug for STAC Capital…), rather than just handing some financial information to a banker and asking them to please consider. Lots of talk of fintechs, but they’re really only playing in the sandpit, generally maxing out at $3-500,000. There’s at least one new bank making its way in this country, but maxing out at about $5m, potentially soon $10m. 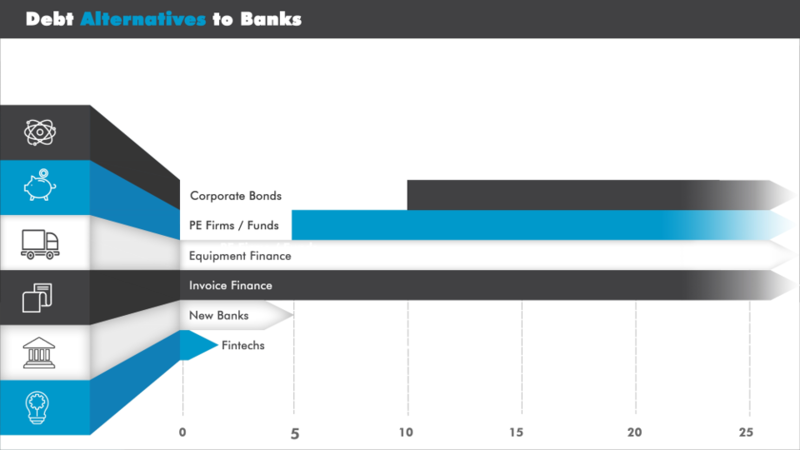 Equipment & Invoice Finance companies - nothing much has changed there - there’s plenty of players and they’re still active. They’re great when the business and the need fits with their products, but they’re certainly not a solution for everyone. Finally, Private Equity firms and Corporate Bonds are increasingly entering the alternative debt space, but they will only play at minimum $5-10m, often only $15m+. Interesting space and one that we expect will continue to grow, in the unlisted space (i.e. companies that don’t have a corporate rating from Moody’s or S&P). Not very many transactions have been done, but we’re tipping that it will escalate quickly as banks become tougher and tougher. Too many to tell here, but these are the key points that often cause a problem with debt that has been structured for M&A, or any business finance for that matter. Keep an eye on these when structuring your debt, to avoid trouble later! Which is better - Debt or Equity? Simple question that doesn’t have a simple answer. Here’s a few fundamental differences between debt & equity, along with a question of control - which is often the deciding factor for business owners. One of the biggest problems we’ve seen over the years, post M&A, comes down to something that sounds SO simple when you lay it out, but is often buggered up. First start with your Mission & Strategic Goals, then consider what is important to your company & shareholders? Is it growth at speed, or minimising cost, or asset protection, or maximum leverage, or being able to extract dividends for personal wealth/lifestyle, or…? Then, what options could exist, that work for & support that strategy? Finally, then structure & negotiate full funding package that suits everything you’ve worked out above! As always, I welcome any comments or questions - fire away!